This item will take 28 Working Days to be delivered. We will contact you to arrange a suitable day for you to receive your order. The Classic divan bed set is good quality bed and mattress at a great value price point. The Classic bed and mattress are hand made in UK. 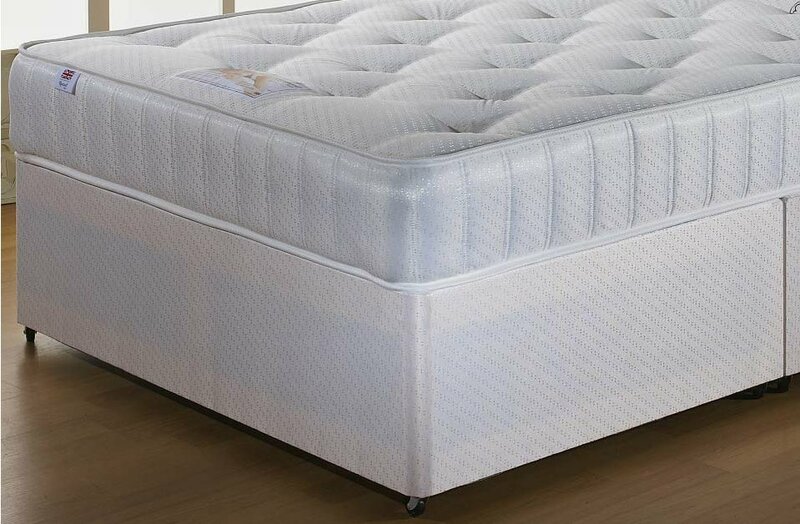 The mattress features a quality 13.5 Gauge spring unit and generous fibre fillings, this combination gives the mattress a medium firm feel ensuring comfort and support. Despite the budget price point the Classic bed set is actually made from good quality materials, the mattress is finished with a quality damask fabric and is hand tufted again increasing the durability and lifespan of the mattress. The traditional design and construction combined with the quality damask cover give the mattress a look and feel of luxury, particularly impressive given the budget price point. The Classic is a superb divan bed set that looks superb in both traditional and contemporary environments, the product blends quality materials with traditional manufacturing techniques resulting in a product which exudes quality despite the bargain price. The bed meets all of the UK's quality and safety standards.